This document will demonstrate how to properly add faculty members. 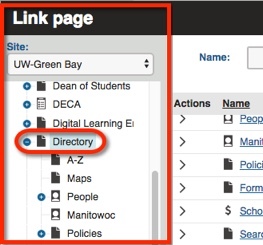 Create a UWGB Faculty & Staff page. 1. 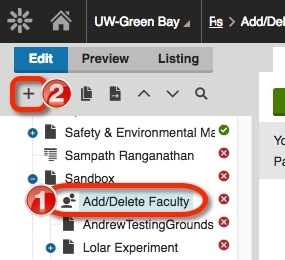 Select the UWGB Faculty & Staff page and Click the New button. 2. 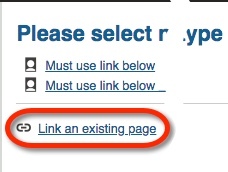 Select "Link an existing page"
3. Search for the Directory on the navigation bar and expand it. (click on the + symbol). 4. 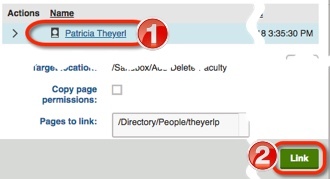 Select People and search for the faculty member using last name. 5. Select the faculty and click the link button. 6. 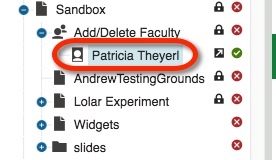 The faculty member page should appear under the Faculty and Staff page. 7. Repeat Step 1-6 to add additional faculty.